Design by Ramon Garcia Jurado and Paco Pacovi via Nuevo Estilo - the magazine that always leaves me wanting more. 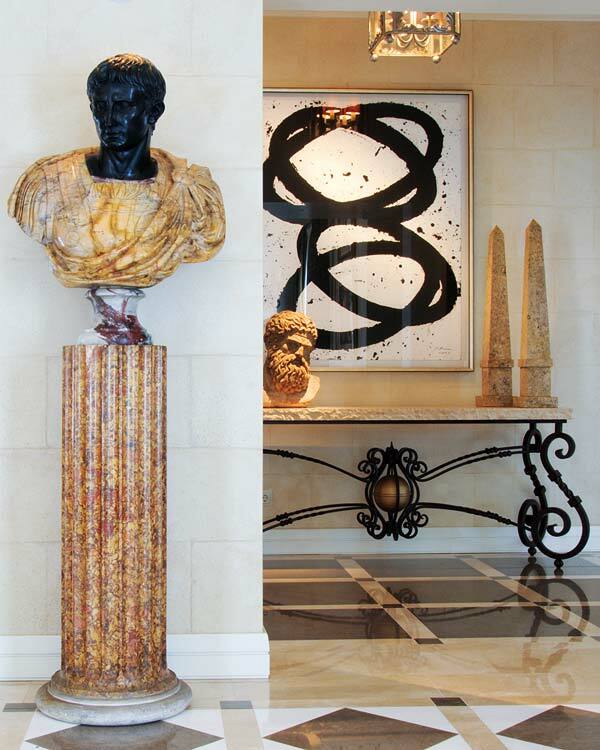 After looking at this image a long time I noticed a trio of black; in the bust, the painting and the iron of the console table. To see more of their work, you can visit their site here. SO beautiful! I will take a look. I awarded you the Supper Comment Award! That is fabulous, Michele. I'd never leave my home if it looked like that. Thanks for the treat! i love the art over the console.and i think the console is pretty smashing too. Eye candy is right. I'm trying to figure out our entry way right now -- wish it looked half that gorgeous! Thanks for the inspiration! What a fabulously chic space! Every single detail is stunningly perfect! A perfect statement grand entrance! That modern art makes such a statement. Such a nice combination of pieces and finishes. Liberace would have a black grande piano standing behind that foyer.....very grand indeed and nothing like ebony or ivory to create harmony. A perfect entrance...love everything about it!! That juxtaposition leaves me wanting more, more, more! Please Madame, may i have some more! after looking at that post and the other photos, why look at anything else! So gorgeous! The console is stunning! Love this. Thanks for posting. It satisfies my bust, column, Ceasar, and console obessions all at once.